There is no doubt that the strains of living as a slave were many and the conditions brutal. One had their days and nights planned out by their masters from the day they were born until the day they died, albeit the Muslims talked about here were born free and then enslaved. Whether one was born free or born a slave, you were not in control of your daily life. There were certain aspects that West African Muslim slaves did try to control once they came to the Americas. For example, enslaved Muslims found the nakedness they were forced into humiliating and offensive to their religion. They looked to make head wraps and long garments from anything from old blankets or hand-me-downs from their owners. 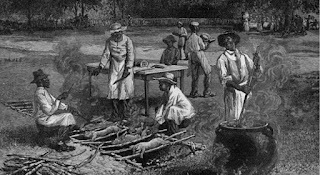 Where slaves could find autonomy they exercised it; one of these was adhering to the Islamic dietary laws. One of these laws was abstaining from alcohol even though it was widely available and consumption was encouraged. Ayuba Suleyman Diallo, from modern day Senegal, was enslaved in Maryland for two years before being sent to England. It was in Maryland that Diallo was interrogated about a crime and was offered alcohol to ease his fears about the situation, he flatly refused. Diallo was not alone in his refusal of alcohol; Ibrahima Rahman, also refused alcohol. Unfortunately, there was less control over the types of meat that was given and available to eat. The cheapest meat of the day was pork and was found in abundance. There were instances such as Nero, a Muslim slave who was the bookkeeper for the William Ball plantation in South Carolina. Nero was allowed to draw his meat rations from beef rather than pork. This may be a privilege of being a bookkeeper (a prestigious job that a slave could have) and less his owner being concerned with Islamic dietary law. Diallo, not only refused alcohol (as mentioned before) but, would only eat halal meat. The other option would be to forgo the consumption of meat, which is what Salih Bilali and other enslaved Muslims did on the Hopeton Plantation in Georgia. Enslaved Muslims could have chosen not to fast during Ramadan but, there are a few reasons why they may have chosen to. It is important to acknowledge that each plantation had to have their own moon sighting to keep track of the Islamic months. Enslaved Muslims were looking to keep their Islamic identity in enslavement just as they would have if they were slaves in their respective homelands. Enslaved Muslims were fighting this idea of not only being slaves but, being legal property with little to no rights. Muslims could not justify neglecting their religious duties because of the social conditions. This was not a phenomenon only in the United States but, wherever West African Muslims landed there was an attempt to hold onto their religious duties. Muhammad Kaba for example, a Muslim slave in Jamaica, would pretend to be sick whenever he wished to observe fasting. In the hostile world that Muslims found themselves in following their religious customs was a way to stay connected to home and worship. The eagerness to follow their religious rituals and laws was seen in the United States, South America, and the Caribbean. Individual Muslims, families on plantations, and entire communities in Brazil, looked to salvage the little autonomy they had by following through with their religious obligations the best they could.